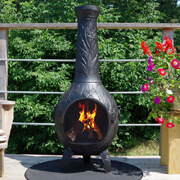 The Orchid outdoor fireplace Chimenea has a stunning Orchid design over basket weave pattern. Has almost a tropical feel to the design that looks good in any outdoor setting. 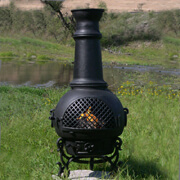 Cast aluminum construction radiates heat all around the chiminea and requires very little maintenance to keep looking good. 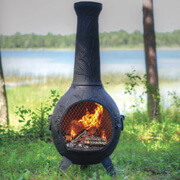 Designed for years of use, choose from wood burning or natural gas/propane models below.